Even though you may marvel at modern computers, power plants, and other devices, our species should have been much further along than it is at this stage. You will find that some of the greatest inventions in power generation were never developed because of politics and ego games played by the likes of Thomas Edison as part of his quest to destroy Nikola Tesla. 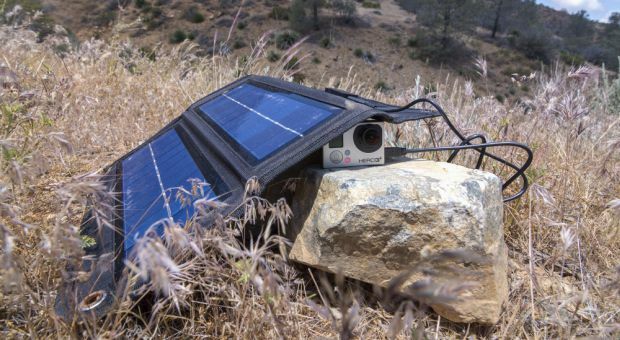 Nevertheless, Tesla’s patents still exist, and amateur electronics hobbyists are reviving some of his greatest inventions. This includes the Tesla Turbine, which does not require a centralized shaft and can run as easily on air as it does water. While Tesla’s original turbines were built using metal disks and heavier machinery, working units can also be built from smaller parts like CDs and magnets. Windmills, steam turbines, and many other devices rely directly or indirectly on air, water, or something else striking a blade mounted to a central shaft. As the blade moves, the mechanical force is converted to electricity via magnets and coils, or it can also be used to propel wheels. The Tesla Turbine is different in the sense that air and water do not strike a blade. Instead, some of the air or water pushes the outer edge of a disk, and the as the rest is pulled between the disks, flow is converted into tighter spirals which generate centrifugal force. As the disks spin, the spirals become tighter, which increases rate of speed. Once you have a spinning motion, magnets mounted on the disks produce current in stationary coils mounted on the outside of the case. Alternatively, you can use magnetic coupling to drive motors, or spin just about anything else of interest to you. 8 neodymium magnets (the strongest ones you can get). For the demo version I used 10 x 5 x 1 mm magnets. Step 1: Take 1 CD and glue four magnets to the shiny under side. All of the magnets should have the polarity going on the same direction. It does not matter if you glue the north or south end to the disk. Try to make them an equal distance apart so that they balance in terms of weight distribution. Step 2: Take the second CD and glue the other 4 magnets to the top of it (where the label usually goes). Once again, make sure that the poles of the magnets are all going in the same direction. This time, however, make sure that the magnets will try to draw to each other when this second disk is between the magnets. 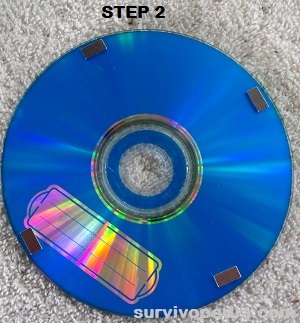 It should be noted that the shiny side of the CDs should face each other, since there is a natural groove between them that makes it easier to draw water or air into them. When building multiple stacks of CDs, you should still put as many shiny sides together as possible. 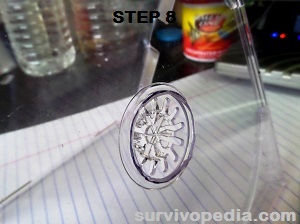 Step 3: The magnets should attract to the ones on the other CD and hold the two disks together. For this demo, I did not glue the disks together, however that would be necessary for units that will turn at a higher RPM. As the disks spin, there is a natural tendency for them to try and move away from each other. This effect can rapidly overcome the capacity of the magnets to stay bound together. 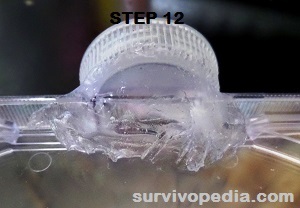 Allow glue on the disks to dry for at least 24 hours before proceeding to Step 11. In the meantime, you can still do steps 4 – 10. 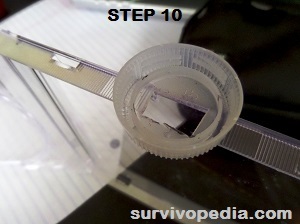 Step 4: On the lid of the jewel case, draw a box that will be cut away to make an opening port for the turbine. Next, draw a round space in the center where the exhaust will go through. It is best to place the exhaust port near the spindle area, since it is closest to where water or air will exit from between the disks. Step 5: Disassemble the jewel case. 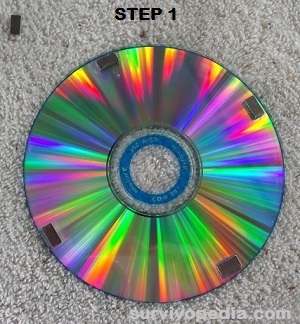 You should have three parts: the upper lid where the front jacket goes, the lower lid where back jacket goes, and the third – the central portion that holds the spindle that keeps the CD in place. Step 7: Use the coping saw to cut out the inflow port. Then use the Dremel to cut and drill out the exhaust port. Step 8: Reassemble the jewel case (photo: 5 after cutting). Take a bottle cap that has a thread size suitable for air or water attachments of interest to you. Cut the cap in such a way that the opening is the same size as the inflow port. 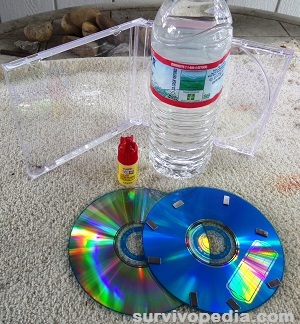 Glue the bottle cap to the lower section of the CD case in such a way that the hole in the case matches up with the one on the bottle cap. Make sure the threads are facing outward so that you can use them to screw in air or water hoses. 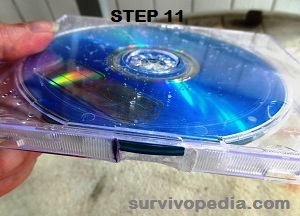 At this stage, make sure that the upper lid of the Jewel case can still be opened and closed. 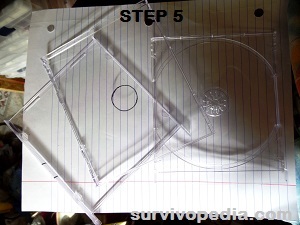 Place CD disks inside the jewel case like normal. 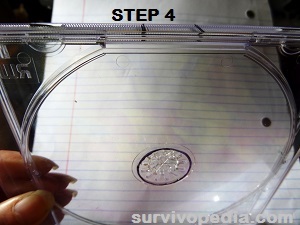 Step 12: Seal the outer edges of the CD to prevent air or water from escaping. 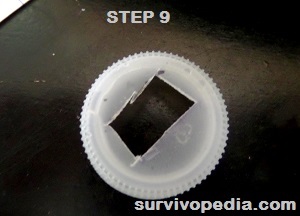 If you added a bottle cap to the inflow port, make sure all areas around it are also sealed off. Wait another 24 hours for all the glues to dry. In order to operate the Tesla Turbine, simply attach an air or water hose to the inflow port and let air or water start flowing. 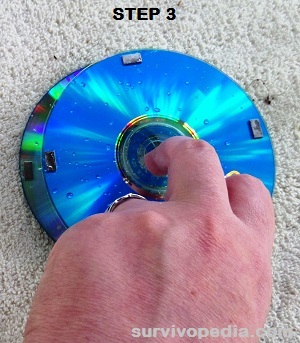 You can also use a garden hose (as in the demo video) to see how easy it is to make the CDs spin. When operating the turbine, you should not be holding it or be anywhere near it; since they are prone to exploding when the RPMs exceed the capacity of the magnets and strength of the disks. The hose in this video was set with enough pressure to make the disks move, plus there was plenty of area for the water to escape. 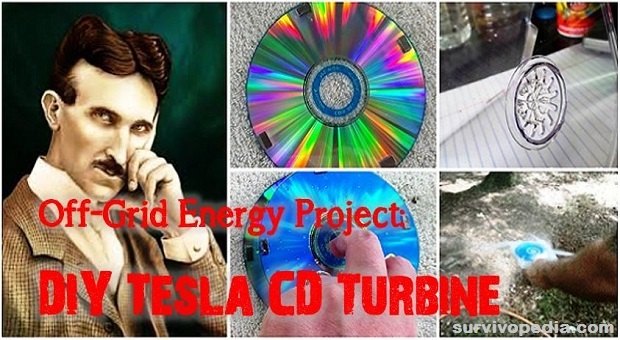 The CD version of the Tesla Turbine can be used in endless ways. Individual units can be stacked together to create larger amounts of electricity. They can be connected to windmills, placed under moving water, and coupled with millions of devices that rely on a motor or rotary motion. The Tesla Turbine is a fairly simple, EMP proof device that can generate power in just about any circumstance. It’s up to you to imagine a use for this turbine. Learning how to build a working model can help you save on your current energy bills and also help you survive crisis. Any thoughts concerning an implanted defibrillator and EMP? The best info I could find was at this link. They think right now newer pacemakers can withstand an EMP – probably because the unit itself is housed in some kind of shielding. I will see if I can make some other inquiries and perhaps also find out how the shielding is being done. Very interesting work. I would like to get to know you better. I have degrees in biology , chemistry, and agriculture and was a class A wastewater treatment I plant operator instructir. I was a master gardener but had to leave my career to care for my mother. I now have very limited resources ur a handicapped mother and three children. I am just starting so have much to learn. I appreciate all Zi have read of your work and have great admiration for your endeavors. Huge pat on the back! If you do such things my fb is Mary Alice Hukill in Missouri. I would love to be in touch with you and discuss your projects and interests. I am very isolated and dealing with depression but have chosen a micronutrient route of treatment and intelligence is a scarcity in my current location which is pretty much run by methamphetamine 🙁 Just wanted to say thank you for your input. Always a joy to read! Keep it up! And, how much energy to spin the generator, is required…??? Edgrrr… A Delco alternator, with a l;arge fan blade is better…welding current, as opposed to, trickle current…. Good question. The CD turbine can’t take much over 90 PSI, and if balanced right, it will turn if you breathe into it. 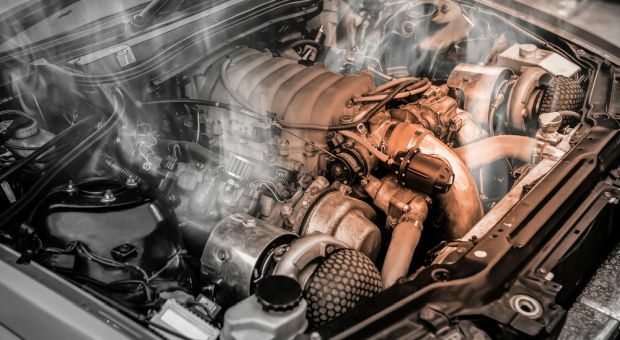 My thought is that trying to turn a conventional alternator is not needed. The design I am working on is more in the direction of using stationary coils to generate the electricity; I will be testing straight, rodin and toroidal that I make myself to see which works best. After that I intend to use either wind power in a shell design to gain sufficient PSI to run the turbine, or I will use a stirling engine attached to a solar heat array. I don’t like the cost of the stirling engines; so am still on the hunt for better ideas there. I like your design and can see using it with multiple disks and magnets to produce more current and voltage. What I did notice is you offer nothing about the “stator”, the fixed coils that the magnetic flux will induce voltage in. I’m not trying to pick at you, it’s just there are quite a few people with little to no experience in building a generator and they don’t understand the principles of induction to produce electric current or voltage, consequently they will not be able complete a product to produce a device to create electricity. 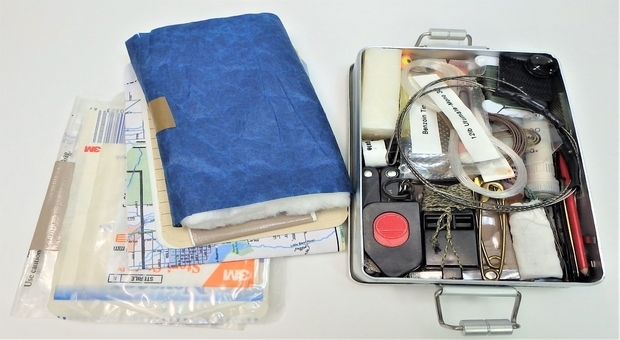 I have been reading many DIY projects on Survivopedia and am impressed so much by the articles as well as the knowledge of the writers. I have a brief one for you I’ll call “Give AND get”,…how to make your own Potable Water(29 pints/day from your Dehumidifier PLUS) & cool your air as you INCREASE the available Humidity in the air for reaping by your Dehumidifier. This set-up only requires three systems: An energy-efficient Dehumidifier, A “Swamp Cooler”(standby for explanation), and your emergency power source. “Swamp Cooler” is nothing more than a .65 Amp 9″ 110v Fan which blows air across wet material like cheese cloth and as evaporation occurs, cooling happens and moisture goes into the cooler air. Moisture is picked up by dehumidifier and condensed into water to be filtered before drinking. E-Power source can be solar/batteries & Inverter or wind/otherwise. My Dehumidifier draws only 3 amps. My E-power source is 3-100 watt SV Panels @5.65 a/hr through 30 amp Controller into 3-110 Amp/Hr. Deep Cycle sealed Lead Acid Batts. Plenty of power to run this whole unit and then some to have Potable water for three people. I will provide complete info and diagrams to anyone interested by e-Mail.